First of all, big congratulations to the PNav team and KinetX, and the INav team at NASA. They successfully navigated New Horizons to an interplanetary dartboard (B-plane) at Pluto. But they weren’t aiming for the center of the target, since that would be Pluto, they were aiming for a spot on the inner rings near the orbit of Charon. In this sport, an outer bulls-eye is absolutely worth more than an inner bulls-eye (unless you actually intend to hit the targeted body, like Deep Space 1). Their accomplishment did not go unnoticed—although their hard work is certainty under-appreciated. If New Horizons was too busy performing scientific observations, rather than downlinking data back to Earth, how do we know when it arrived to Pluto? Where did this number come from? Why/how did the spacecraft arrive 72 earlier than expected to Pluto? 1. They technically didn’t, and probably still don’t, know it’s true arrival time. They didn’t even know if the spacecraft survived the encounter until 12 hours after the flyby, when New Horizons transmitted its little “I survived” system health information. What NASA simulated was an estimated arrival time, not an actual measurement. You can thank the navigators for that estimate! Plus even if New Horizons did take its valuable time during the encounter to downlink inertial information, we wouldn’t have received that message until 4½ hours later. Let’s glance at Figure 1, and follow through a little bit of statistics, in order to clarify where this “72 seconds too-early” came from, and what it actually means. Before I begin, let me be clear though: this Gaussian distribution example is just an easy representation of what the data means, not fact. The Gaussian (normal) distribution is a commonly used model in statistics. The centered “μ” represents the mean (and, in this case, the median) of the data, and “σ” the standard deviation. In English, μ is the center and σ is the width. As labeled, about 68% of the measurements are in the interval μ ± 1σ, 95% in μ ± 2σ, and 99.7% in μ ± 3σ. In other words, the probability that a data point will be outside 1σ is 32%. Why do we even care about the mean/center value μ? I won’t prove it (look into the principle of maximum likelihood), but in statistics, the best estimate for this distribution is simply the mean value. If you had to bet on a number in this sytem, you better bet on the mean/center value. Let’s put this all together. The time aimpoint for New Horizons’ closest approach of Pluto was 11:49:57 UTC. This aimpoint was based on the optimal time to gather scientific data during the critical dual occultations. On July 13, a day before the encounter, the navigators calculated μ = 11:48:45 UTC, with 1σ = 36 seconds. In other words, there is a 68% confidence level that the spacecraft will arrive to Pluto sometime within the range of 11:48:09 to 11:49:21 UTC. 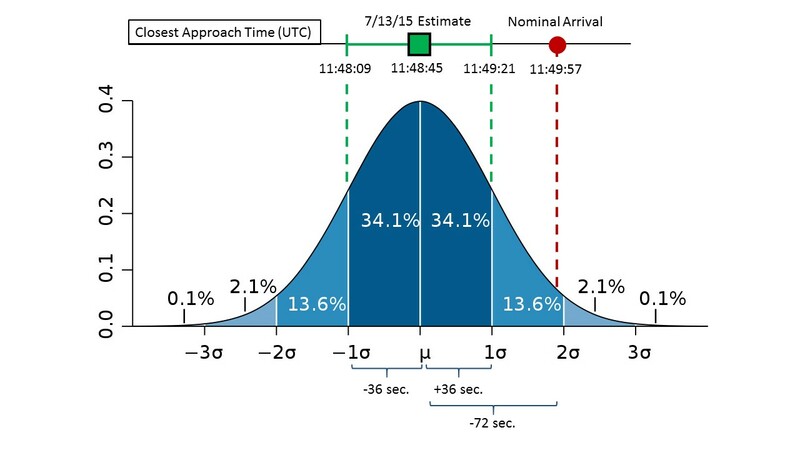 Since 11:48:45 UTC is the mean value, it is therefore the best estimate for the closest approach time. If you subtract 11:49:57 by 11:48:45, you get none other than 72 seconds! Using statistics, the navigators figured out that the spacecraft would most likely reach Pluto 72 seconds earlier than desired. Am I saying that this early arrival was expected? Yes, it actually was. No, it was not dark matter, dark energy, or a black hole which accounted for this early arrival. The navigators knew about this after they preformed their final orbit determination deliveries after TCM (TCM17B1). For nearly 2 weeks before the encounter, they knew this! If you don’t believe me, wait until we go over Figure 2. During the last week, they also uplinked a correction for the time sequencing of the instruments to account for their new arrival estimation. That’s where this early arrival stuff gets tricky. Lets say you call your boss saying you’ll be 5 minutes late to work, and you will probably arrive at 8:05 AM. You were supposed to be there by 8:00 AM. However, your boss is understanding and says “that’s okay, arrive at 8:05.” At exactly 8:05, you arrive. Are you late, or right on time? Based on your boss’ acceptance of the new arrival time that you delivered, you’re technically on time. The New Horizons team knew about this early arrival and corrected for it. It didn’t arrive 72 seconds too early, it arrived right on time. However, they wanted to arrive 72 later for ideal scientific observations, just like your boss expects you to be at work on time. Point is, this early arrival time was expected. 2. The specific why or how to this question is hard to answer, since there are so many variables. My simple answer to both: trajectory correction maneuvers (TCMs). These are statistical maneuvers preformed in order to correct the trajectory of the spacecraft. Remember, they’re aiming for a small region on a dartboard placed out at Pluto. The navigator’s objective is to approximately determine the time of arrival, and minimize its uncertainty. Check out Figure 2, which depicts some estimated arrival times of New Horizons to Pluto, and their respective error bars. The error bars are the uncertainty in time (of closest approach), analogous to the uncertainty representation in Figure 1. Although the x-axis is unspecified, the flow of data from left to right is chronological (oldest to newest estimates). Inspecting the data points, you can see that both the time (y-axis) of the points change over time, and their uncertainties decrease. Just look at the huge difference in values from 7/7/14 to 2/24/15! During the last few weeks/days before the encounter (6/26 and 7/12), the navigators were able to significantly decrease the uncertainty via optical navigation methods, including new observations of Nix and the improvement in determining position parallax as the spacecraft got closer to Pluto. 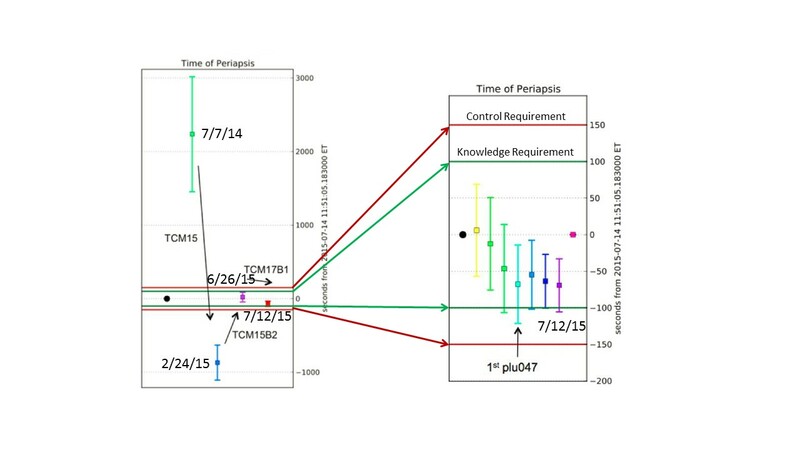 New Horizons had two main navigation requirements: the control requirements (the red boundary in Figure 2), and the knowledge requirement (the green boundaries). As mentioned above, the aimpoint was the nominal time in which the spacecraft should encounter Pluto in order to deliver the best scientific observations during the dual occultation. These requirements therefore set the boundaries that the navigators have to stay within. And they were successful! After TCM15B2, they were within boundaries of this requirement. However, New Horizons was then expected to arrive later than desired. The final TCM, TCM17B1, occurred on June 30 and set the spacecraft on course to arrive earlier than desired. Why did they arrive 72 seconds, and not exactly at the aimpoint time? Well I suppose the blame could be on TCM17B1, but it’s really just due to the nature of statistics and uncertainties. If it was a little bit of a softer maneuver, maybe they could have been spot on with the desired time. But these maneuvers are very challenging; the thrusters are changing the spacecraft’s velocity by less than 1 m/s, yet the spacecraft is traveling at an insane 13,700 m/s. Accounting for all the uncertainties in the propulsion system, precise maneuvers are not possible on the order of mm/s and cm/s. Statistics just has to go out and ruin everything for us. Uncertainties are inherent. Errors are inevitable. Anyways, since the start of July they knew about this early arrival. Then on forward, the navigation teams were performing their orbital determination deliveries to determine exactly when and where the spacecraft would reach Pluto. The navigators performed over 100 orbit determination deliveries during flight to Pluto, and 37 critical deliveries. Each delivery had a new estimate of position and time of the spacecraft. I’m sure the navigators barely slept during the last week of the encounter; everyone relied on their work. I’ll only ramble on a little bit longer. The arrival date to Pluto, July 14, 2015, has pretty much been set in stone every since the trajectory was optimized. I don’t know about you, but I think it’s incredible that the mission designers were able to propagate their iterations a decade into the future and determine the exact date of arrival. We haven’t even been observing Pluto long enough for it to complete one orbit around the Sun! Back in 2003, the closest approach time was 12:20:00 UTC. In 2005, it was 11:59:00 UTC. These were Monte Carlo simulations, not based on any measurements. However, after launch in 2006, the navigators were finally able to start using some radiometric/inertial measurements for their orbit determination solutions. It wasn’t until 2014, when the optical navigation system kicked in, that the navigators were able to start getting some estimates with low uncertainties. In the last day before the encounter, they were able to nail the time down to 11:48:45 UTC ± 36 seconds. Just think about that number for a second. 4.25 light years away, and after a 9.5 year journey, the navigators were able to determine the time of closest approach to less than half a minute uncertainty. Half a minute uncertainty, after almost 10 years. The navigation on the Google Maps app, which is GPS based, can’t surpass that time uncertainty. If you’re trying to preform 380 time-specific, choreographed observations and you arrive to Pluto 10 minutes late, on 11:59:00 rather than 11:48:45, you literally just missed every single observation. You’re pushing your luck even asking for a little snip of a targeted body in your instrument’s field of view. This is why the timing/position estimates are critical for every spacecraft mission, not just New Horizons. The navigators are the saviors. A $700 million mission’s scientific success was reliant on some damn-good statistical estimates. Thank you navigators, once again. If you’re looking for a great book on the field of spacecraft navigation systems (with a chapter on optical navigation), check out Andrew Butrica’s The Navigators: A History of NASA’s Deep-Space Navigation. Matt, you pretty much nailed it. Excellent post, easy to read and understandable. I’ll quibble about one or two things, but as you well understand, it’s in the nature of us engineer/Navigators to quibble, and this in no way detracts from the overall excellence of your post. We need more writing like this! The main reason for the large uncertainty in arrival time was that the Pluto orbit itself was not nailed down very well, even with Hubble observations and decades of astrometry from lesser telescopes. It wasn’t known well because we’ve only seen Pluto through about one-third of its orbit since discovery, and you need more like a complete revolution to determine it well. Anyhow, the distance to Pluto was not known to beter than about 1400 km 1-sigma—hence the 100 seconds at 14 km/second assumption about uncertainty that we started with at the beginning of the mission. We knew the spacecraft distance from the Sun and Earth much better than this, but that doesn’t help when you don’t know its distance from the target. As you pointed out, the only way to get this before arrival was through optical navigation, using the rate of expansion of the system in the images to determine the distance to go. That helped, but it didn’t get the uncertainty below 30 seconds before we got there. We actually didn’t do an update to the onboard sequence in the last few days because we’d been spooked by the July 4th safing event. The mission director, Alan Stern, rightly decided he didn’t want to take any last-minute chances at all that might blow the whole mission and it’s nearly one billion dollar cost, even though we Navigators, from our narrower perspective, recommended to do it in order to recenter the sequence design around our later solutions. One last nugget: we looked at the Pluto occultation timings yesterday and derived a back-of-the-envelope closest approach time of 11:48:26 UTC, which puts us, if I did the arithmetic right, about 91 seconds earlier than the nominal. That’s about the best we can do at the moment until we fill in the tracking data hole around c/a time with (we hope) images of Nix and Hydra and perhaps the others in a few weeks. We don’t fully trust the radiometric solution we got yesterday, because there was a fearsome amount of non-gravitational accelerations from the thruster activity around the encounter, and we’re still struggling to model that. Anyhow, thanks for the excellent post, and I’ll pass this blog on to the rest of the Navigation team. Thank you for the clarification and information! I’m not sure about other undergraduate aerospace programs, but my spacecraft design courses made no mentioning about spacecraft navigation at all. It was during the last quarter of my senior year (only 2-3 months ago) that I discovered this crazy little field of interplanetary navigation. And it’s been an unexpected journey to try to learn as much about the field as possible. I’ll correct my blog with this information. There’s no “Spacecraft Navigation for Beginners”, it all boils down to the experience derived from within the field—none of which that I have. So I truly appreciate any pointing out of my ignorance, and the additional information; it’s not just beneficial for my sake to be both precise and concise, but also for any readers. The navigators have a truly amazing and fun story to tell, I’m just trying to do my part in promoting it!